Care to dance? Cause 'Lady in Red...she's dancing with me'.. with her long climbing arms. Don't worry, she won't invade your dancing space as the plant is well contained and more compact than many Climbers. 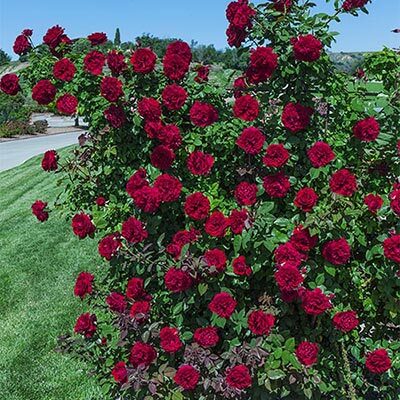 The lady was born and raised in the USA, with her flowers bearing the true classic AMERICAN red coloration. That means no hues of pink or blue all the way to the end of the flower's life. The large ruffled old-fashioned blossoms will take your breath away and falling in love with this lady is the only possible outcome. Are you ready to dance the night away? You better be because the vigorous plant generates bounteous flowers just waiting for a dance partner. Parentage Valentine's Day x Oh My!